Every year, my reading goal is 100 books. I don’t think I have ever reached my goal, and this year I fell even shorter than last year. Nevertheless, I read some books that I really liked. Not all of my top five books were published in 2018. Furthermore, it was pretty hard to narrow my book list down to five. Here are the five favorite books I read this year, in no particular order…..
Willow is 10 years old, and her mother Polly was in her 50s when she was born. Willow lives in fear that her mother will die before she is grown. As for Polly she lives life to the fullest, but carries the burden of secrets that she refuses to share with her daughter. And then when tragedy strikes, they take a trip back to Polly’s old stomping grounds and Willow learns her secrets. Eleanor struggles with appropriate social skills, and prefers to live her regular, if boring life in which she never strays outside the lines. And then she meets Raymond, and their friendship opens her up to new possibilities. I loved this book primarily for the characters. In The Word is Murder, author Horowitz literally writes himself into the book as one of the characters. A disgraced police detective, let go from the London police force is hired as a consultant for the case of a mysterious murder of the mother of a famous actor. In Sherlock Holmes/Dr. Watson style, the detective — known only as Hawthorne — hires Horowitz to work with him on a case, and chronicle it by writing a diary. The premise is as clever as can be, earning it a place in my top five favorites. Alice Whitley agrees to become the assistant to famed author Mimi Banning as she writes her first book in years to ensure that the book is completed. Part of Alice’s job description is taking care of Mimi’s 9-year-old probably-autistic son Frank, who is one of my favorite characters of all time. He is smart, funny, and loves to dress up like 40s movie stars. I enjoyed the story, and simply adored Frank. Anne Tyler is one of my favorite authors of all time, but I have been disappointed in her most recent efforts. I found Clock Dance to be back to the author’s standards, featuring characters with whom I could be friends. Willa Drake has had plenty of sadness in her life. 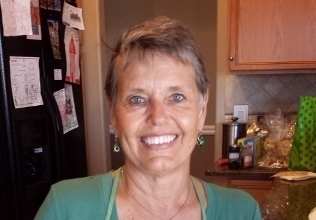 Her mother was bipolar, and her first husband died in a road rage accident. She is comfortably settled into a pretty boring marriage with her second husband, when she gets a call that takes her to Baltimore and changes her life forever. Honorable mentions: Woman in the Window by A.J. Finn; Caroline: Little House on the Prairie Revisited, by Sarah Miller; and Then She Was Gone, by Lisa Jewell. Anne Tyler is one of my favorite authors. Her books — most of which take place in, or have some connection to, the author’s home town of Baltimore — always contain clever and realistic characters who manage to find some degree of contentment at the end of the day despite obstacles they face. Having said this, her past few novels have been a bit of a disappointment, at least as compared to such classics as Dinner at the Homestead Restaurant or The Accidental Tourist. But her latest novel Clock Dance was a winner in this reader’s opinion, and left me with a degree of satisfaction that I haven’t come across in a novel since Fredrik Bachman’s Britt-Marie Was Here. Both novels present a female lead character who has spent most of her life doing what others think she should do. Until they don’t. Young Willa Drake lives with her mother and father and a younger sister. Her mother is mentally ill, probably bipolar. When Willa is about 12 years old, her mother suddenly disappears, leaving Willa, her sister, and her kind, but rather namby pamby, father to cope. Fast forward to her college years, where she meets, and finally agrees to marry, another student who loves her, but is pretty sure he knows what’s best for her. And having never learned to stand up for herself, she agrees. They are happy together, and have two sons. And then one night, a road rage incident results in Willa suddenly being widowed. Fast forward once again, and Willa has remarried. Unfortunately, her sons are far away and they have grown apart. One day Willa receives a phone call and her life changes forever. She agrees to travel to Baltimore from her desert home, and becomes the caregiver to — now stay with me — her son’s ex-girlfriend’s little girl — when said ex-girlfriend is in the hospital with a broken leg. It’s only supposed to be for a short time. But Willa’s life changes forever. Full of the quirky characters that fans of the author have grown to love, Clock Dance is the kind of novel in which the reader — particularly if the reader is a woman — wants to shout HOO-RAY at the end of the book. I loved this book. Welcome back to my bookshelf, Anne Tyler. Bestselling author Anne Tyler is known for her quirky characters and her clever story lines, but in her most recent novel, Vinegar Girl, Tyler has some help from someone fairly reknown himself – William Shakespeare. Vinegar Girl is part of the Hogart Shakespeare project sponsored by Hogart Press. The Shakespeare project provides readers with a variety of Shakespeare works retold as contemporary stories by a variety of well-known authors. 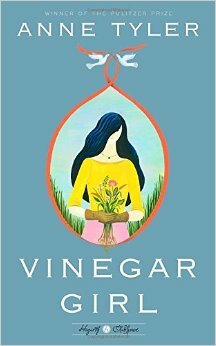 Vinegar Girl is a retelling of The Taming of the Shrew. I would love to tell you all the ways in which Vinegar Girl is better or worse than the original Shakespeare play; however, I’m somewhat embarrassed to tell you that I have never read it or seen it performed. Okay. I got that off of my chest. Following her mother’s death, Kate Battista took over the care for her discombobulated scientist father and her pretty and conceited younger sister Bunny. She gave up her dreams of college and instead, cooks and cleans their home, tries to steer Bunny towards good decisions, and works as a preschool teacher. Dr. Battista learns that his Russian research assistant is about to be deported, meaning they will have to give up on the research project they have been working on for many years unless they can find a way to keep him in the United States. Dr. Battista comes up with the idea of his daughter Kate – who seems unmarriageable anyway – marrying Pyotr to keep him in the US. The storyline plays out in a way that is humorous and frustrating, delightful and infuriating, poignant and playful. The plot allows Tyler to write in her usual clever style, and while the Shakespeare play apparently ends with the main character explaining to her sister that she made her decision because men are sovereign, Tyler’s ending is absolutely perfect. Flawless. Charming. I admit that though Tyler has always been one of my favorite authors, I haven’t liked her more recent novels quite as much as her earlier works. But Vinegar Girl left me feeling the way I always have felt – satisfied and wishing that I could spend time with the characters in real life. I have read a few 2015 releases already – World Gone By, by Dennis Lehane; Under the Same Blue Sky, by Pamela Schoenewaldt; and A Spool of Blue Thread, by Anne Tyler, to be specific. I enjoyed all three, and have posted reviews of them all. But there are a few 2015 books that have either recently been released or are yet to be released that I wouldn’t even think of missing for a variety of reasons. Few would argue that To Kill a Mockingbird is one of the most important American books of all time. The characters are unforgettable. Scheduled to be released on July 14, Go Set a Watchman is, for all intents and purposes, a sequel to To Kill a Mockingbird. What makes this book particularly unique is that it was actually written and submitted years before To Kill a Mockingbird. Thought to be lost, the manuscript was found and will be released. Go Set a Watchman features the same characters as To Kill a Mockingbird, but 20 years later. Sadly, author Kent Haruf passed away last year, but not before completing Our Souls at Night, which was released May 26. Set in the same fictional eastern Colorado town of Holt, Our Souls at Night is the story of two elderly people, both who lost their spouses several years ago, who find friendship and love in their later years amidst the small town gossip. Kent Haruf writes the most unbelieveably beautiful prose imaginable. I have this book sitting on my ebook shelf, and am eagerly looking forward to finishing the books I have borrowed from the library to dig into this one. I’m certain I won’t be disappointed. The Truth According to Us by Annie Barrows was released June 9 to much acclaim. Barrows is the author of the much-loved (including by me) The Guernsey Literary and Potato Peel Pie Society. Barrows’ newest novel takes place in 1938 in a small West Virginian town, and tells the story of a young girl forced by her father (a United States Senator) to live in this small town despite her boredom. Boredom that is until she meets the Romeyn family and begins to unravel some family secrets. Sounds very good. Julia Keller has become one of my favorite authors, and her protagonist Bell Elkins is one of my favorite characters. Last Ragged Breath, which will be released on August 25, is the next in the dark mystery series that also takes place in a fictional town in West Virginia. Her novels are contemporary, however. Keller’s writing is phenomenal and richly realistic. I can’t wait for this book to come out. Speaking of mystery series, I’m eagerly awaiting Louise Penney’s next book The Nature of the Beast, featuring my beloved Chief Inspector Armand Gamache. The mysteries take place in a fictional small town near Quebec in Canada. Penney’s writing is imminently readable, but for me, the series is all about C.I. Gamache. I’ve said it before and I’ll say it again; I want him to be one of my BFFs. Our favorite bail bondsman Stephanie Plum and her gang of hilarious friends will be back November 17 in Tricky Twenty-Two. I am compelled to include this book, not because it is great literature, but because every single one of Janet Evanovich’s Stephanie Plum novels have been so funny that I am in danger of, well, never mind. There is no way in the world I would miss a single one of these mysteries. The Stephanie Plum books are one of several that I really prefer to listen to as opposed to reading simply because the woman who narrates the books – Lorelei King – is absolutely tremendous. Author Sue Grafton will be releasing the next in her so-called alphabet series featuring private investigator Kinsey Milhone on August 25. I used to love this series, but as of late, it has began to feel repetitious. Still, there are only so many letters in the alphabet, and this novel, entitled X, is the third from the end. I can’t quit now. For the past 23 books, I have been wondering what Grafton would title the X-book. You know, like A is for Alibi, B is for Burglar, L is for Lawless, O is for Outlaw, etc. I haven’t been able to think past X is for X-ray. Instead, Grafton went for simplicity with the title simply being X. Who knows? Maybe Grafton will start over with double letters. You know, like AA is for Awesome Aardvark. All the Single Ladies, by Dorothea Benton Frank, is a must-read for me simply because I absolutely love her settings, all of which are the low country of South Carolina, near Charleston. Her books always feature a strong-willed woman facing difficult circumstances and coming out unscathed. I like Frank’s writing. All the Single Ladies was released June 9. The story centers around three women facing the death of a fourth woman. I hate books where characters die, but I will undoubtedly give this one a try. My new favorite author, Karen White, has a new novel out, released on May 12. The Sound of Glass follows a familiar Karen White theme – a young woman learns she has inherited a family estate that, of course, has a secret attached. The Sound of Glass takes place in Beaufort, South Carolina, which is a draw for me. I’m not sure I’ll get to this novel right away as White is very prolific and I have only recently begun reading her books. But I will definitely read it sometime soon. Are there books either recently released or soon-to-be-released that you are going to read? Anne Tyler’s books, like the television program Seinfeld, are generally stories about nothing. To be more specific, they aren’t plot driven, but instead, are more about how the characters respond to something and/or to each other. And the gift is in her beautiful writing. I think Tyler is one of those authors that you either like or you don’t. Nothing in between. And she has her good novels and her less good novels. I can’t say I’ve ever read one that I heartily disliked. I think A Spool of Blue Thread, however, purportedly Ms. Tyler’s last novel (she has written 20 to date), is one of her better stories. I can’t relate a plot, really, because I’m not kidding when I tell you that there most often isn’t a plot as such. But I had strong feelings, positive and negative, for the characters in the book. 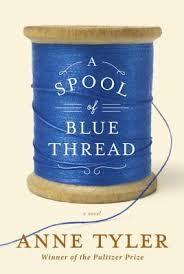 As with most of Tyler’s novels, A Spool of Blue Thread (and don’t you love that title?) takes place in Baltimore. She tells us about the fairly normal Whitshank family, but as you examine them further, you see the cracks and the gaps. Nothing earth shattering. No ax murderers. But the complicated people that all families include. It is also the story of a house. A big house built by the father of our Mr. Whitshank. The younger Mr. Whitshank is a very likeable and patient man who struggles with the foibles of his quirky wife, his difficult eldest son, and his relentless aging. If you consider a house to have human qualities, this particular house has seen its share of laughter and crying. It was designed and built with love by a not particularly loveable man. The best thing about Tyler’s stories is the tenderness in which she presents the characters. You can love them or hate them, but they are never presented unkindly. Somewhere around the middle of the book, the story jumps back in time to give us a picture of Mr. Whitshank’s parents, and it felt sort of unexpected and confusing. Still, in the end, it gave us a good picture of not only his parents, but the Whitshank family members with whom we are familiar from the first part of the book. Because of Tyler’s lovely writing, it works. If you want to get lost in what feels like a nice summer evening, pick up Tyler’s last novel. In fact, pick up any one of her novels. Buy A Spool of Blue Thread from Amazon here. Buy A Spool of Blue Thread from Barnes and Noble here. Buy A Spool of Blue Thread from Tattered Cover here. But A Spool of Blue Thread from Changing Hands here.